As individuals we can all help reduce energy usage and CO2 emissions by turning off the lights or turning down our heating. Such reductions only represent a small fraction of our total emissions however. The majority of savings need to be made in industry and from improved control in commercial buildings, which together are estimated to account for more than half of energy consumption currently used worldwide. All over the world, Governments have already introduced energy saving targets and are putting legislation and regulations in place to ensure they are met. Invertek Drives are leading the way in helping reduce energy consumption and significantly reduce energy bills with their range of innovative Optidrive variable speed drives. Optidrives allow highly energy efficient control of electric motors in a wide range of industrial and commercial applications around the world. 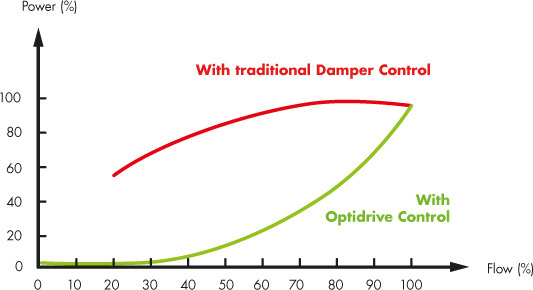 Optidrive variable speed frequency drives help match motor speeds to the exact requirements of each application, saving energy and providing improved control. Variable speed frequency drives within the Optidrive range offer an advanced optimisation function that intelligently matches energy usage to the fan or pump load to ensure your system operates at maximum efficiency. Optidrive AC drives can also monitor energy usage with an inbuilt energy consumption meter that allows energy consumption to be clearly displayed and savings to be calculated.